On March 28, 1942, 19-year-old Cleo Moore died at New Rochelle Hospital in New York from peritonitis from an illegal abortion. Before her death she changed her story and said that Dr. Frank F. Marino had performed the fatal abortion. According to Cleo's roommate, Alice Petersen, Cleo met a man through her work, and discovered that she was pregnant in January. On March 5, Alice said, Cleo visited Marino to arrange an abortion, which he performed at his home office on March 9. By March 11, Cleo was ill and summoned Marino, who sent her to the hospital with instructions not to inform anyone that he had operated on her. Alice also said that Dr. Marino's wife told her to protect her husband, lest "you and Miss Moore...go to prison." Marino testified that he had examined Cleo on March 5, refused the requested abortion, and did not hear from Cleo again until the 11th, when he was summoned to her home and sent her to the hospital without reporting the abortion. Marino, who had been a member of the County Board of Supervisors, the New Rochelle Board of Education, and the New Rochelle Zoning Board of Appeals, was also a golfing buddy of the prosecutor of the case. Marino was acquitted. Chicago: One Victim of "The Abortion Profiteers"
On March 25, 1975, 18-year-old Sharon Floyd went to Associated Concern in Chicago for a safe and legal abortion. Three days later, she died of pelvic infection and blood poisoning. >On July 1, 1975, public health officials closed Associated Concern, which was one of the abortion mills featured in the Chicago Sun-Times "Abortion Profiteers" series. Twenty-two-year-old Lakisha Wilson went to Preterm Abortion Clinic in Cleveland, Ohio on March 21, 2014. She was 19.4 weeks pregnant. After the abortion, she began bleeding heavily due to uterine atony (her uterus wasn't contracting and stopping her from bleeding from where the placenta had been attached). The procedure rooms at Preterm are on the third floor of the building. When emergency medical services arrived, the elevator was malfunctioning. They were delayed in getting the gurney to Lakisha due to this problem. When they entered the room, where Lakisha still lay on the abortion table with her legs in the stirrups, they found her abortionist, Dr. Lisa Perriera, trying to resuscitate her with a pediatric-sized Ambu-Bag. 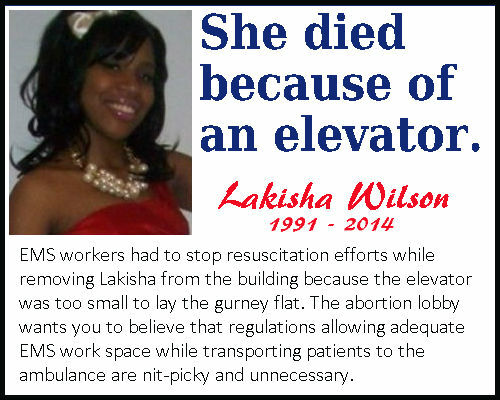 The medics were able to get Lakisha's heart going but were hampered in their further resuscitation efforts because the elevator was too small to properly accommodate the gurney; Lakisha had to be taken into the elevator in a seated position that did not provide adequate access to her airway. Several hours after the bleeding started, she was finally taken to Chase University Medical Center,where she was placed on life support and pronounced dead on March 28.